23rd June 2011 – Allotment Plot at MERL – One of the Comfrey plants in the Brick Composter was starting to grow out of the Composter. Comfrey can be harvested regularly through the growing season to be used as a plant food and as a compost activator. 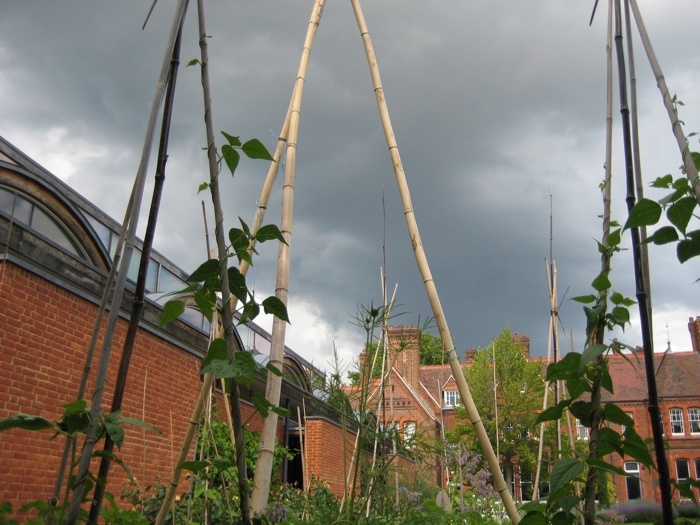 Ella Montt adjusted some of the Climbing Beans to encourage them to grow up the Bamboo. The Beans that had been planted by the Bamboo looked healthier than the plants grown to seedlings and then planted out. Ella Montt harvested a mixture of Peas and also the onions, because their foliage had collapsed. Some of the Carrots had failed; they were removed to the Brick Composter. It is a very unpredictable growing year. Seeds were harvested from the herb plants Chive and Sage. The Borage, Cosmos and Pot Marigolds plants were coming out, a number had self-seeded from last years planting, others Ella Montt had placed on the Plot. Ella Montt planted six Tomato plants where she had removed the Carrots, these were; 2 x Chadwick, 2 x Koralik, and 2 x Brandywine, . It was Midsummer, across the garden was a braying Donkey, and a Wall appeared with a chink through which Pyramus and Thisbe attempted to kiss. 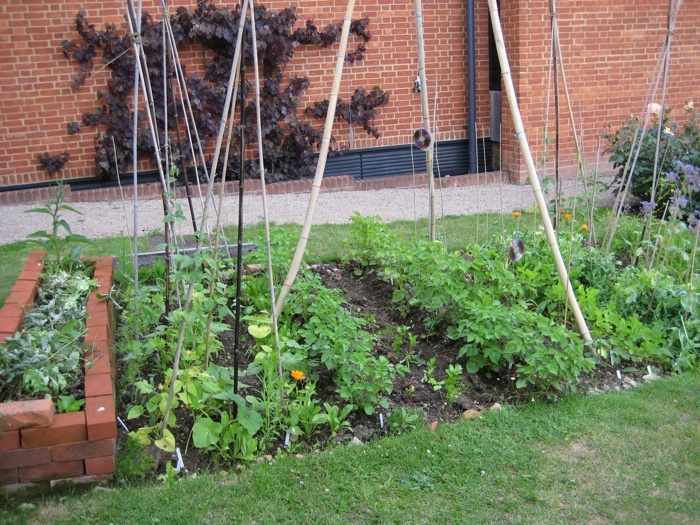 23rd June – Allotment Plot at MERL – Harvest: Onions Swift = 2lb 10oz = 1.2kg; Peas, Ezeta’s Krombek Blauwschokker = 2oz = 60g, a mix of the green Peas = 13oz = 380g. 26th June – Allotment Plot 326 – Harvest: Kale Red Russian Curled = 4oz = 100g; Peas Oregon Sugar Pod II = 2oz = 60g. 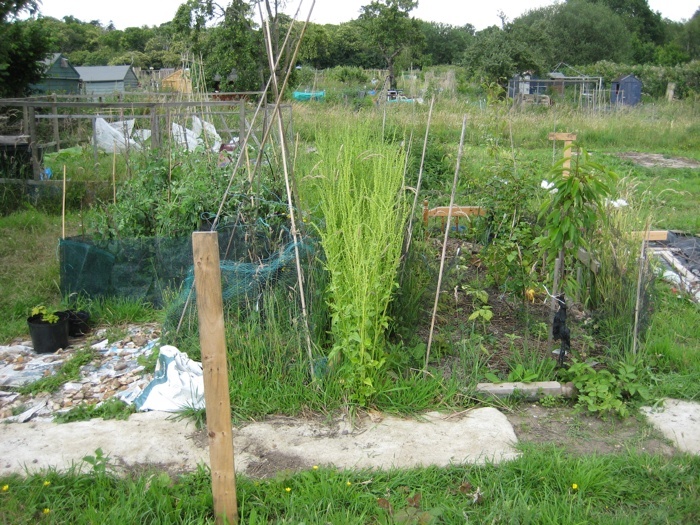 29th June – Allotment Plot 326 – Ella Montt planted more Climbing and Dwarf Bean seeds. Birds or other wildlife seemed to be eating and flattening the leaves of the Peas. The Pea plants looked chaotic, but luckily were producing produce. Ella Montt made a mental note for next year that it was not enough to put a net fence around the Peas with sticks for supports. The Peas needed to be able to climb up strong supports, be fenced in and have anti bird CDs hanging as a defense mechanism. So far Ella Montt had not deployed any Heavy Metal CDs at Allotment Plot 326, this was perhaps a mistake on her part that needs to be rectified. If it is one-thing birds do not seem to sing a long to, it is heavy metal music. The Perpetual Spinach that was already growing on the Plot when Ella Montt acquired it, is developing seeds, which will be allowed to continue to form until ready for harvesting and seed saving. Harvest: Peas Oregon Sugar Pod II = 7oz = 180g. 30th June – There had been Wood Imps that came through a wormhole portal by the woods next to the Allotments. The Imps had caused havoc by breaking things. Captain Swing was unimpressed. Ella Montt and Captain Swing had seen some of the Imps watching them while they were working. The Imps were hiding behind piles of compost and then a shed. Ella Montt had spoken to the Wood Imps that she found in a hollow under a pile of large oak trees that had experienced deforestation. The Imps were not yet mature. A whisper passed around that the Allotment that the Wood Imps were seized and taken to a Panopticon. At Allotment Plot at MERL, William Morris was waiting by the doorway wearing an elaborate print in shades of black and gold. The morning started off bright and sunny, but by midday dark clouds started to assemble over head. Ella Montt planted out the last of Celery and Celeriac seedlings, (the seedlings that were planted at Plot 326 were not doing very well). Ella Montt started to remove the rest of the Pea plants, because they had stopped flowering and were descending to the ground. The Peas were harvested and the Pea plant residue was placed in to the Brick Composter. Slugs and snails that had been hiding under the Pea foliage were moved to different locations in the garden. In the place where Ella Montt had removed the Peas, she planted out four more Tomato plants, these were; 2 x Koralik and 2 x Brandywine. Ella Montt inspected the Climbing Beans at each Bamboo station, then the remaining Bean seeds were taken from the packets and planted next to the Bamboo. At both Allotment Plots, although it was still early in the season, Ella Montt remained unconvinced that the Climbing Beans were going to grow successfully this year. The sun came out and there was no rain, so Ella Montt fetched the watering can from the shed. 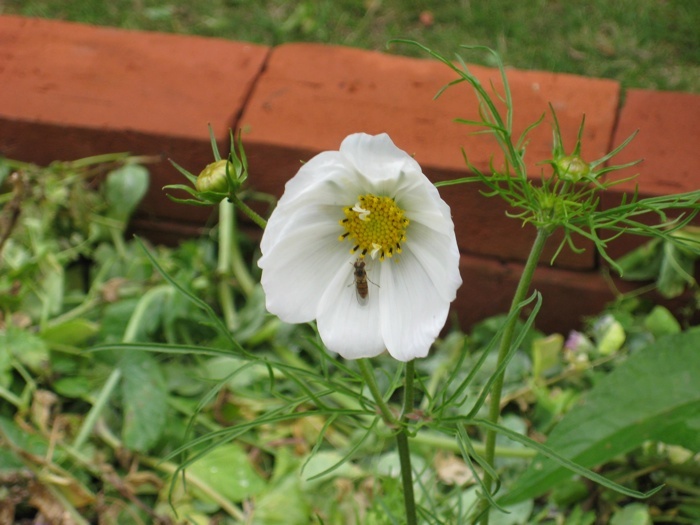 Borage, Pot Marigold, Cosmos and a Dwarf Sunflower had opened their petals to flower, as had male Squash flowers, but not yet female Squash Flowers. Ella Montt broadcasted a mixture of seeds around the Plot, they consisted of Fenugreek (to act as green manure), Leaf Beat Swiss Chard, Rainbow Chard, Perpetual Spinach, Rhubarb Chard, Dill, Onion Ramrod, Coriander Santos, and Florence Fennel Romanesco. Harvest: Peas (a mixture) = 1lb3oz = 540g. 4th July – Allotment Plot 326 – Harvest: Peas Oregon Sugar Pod II = 7oz = 200g. 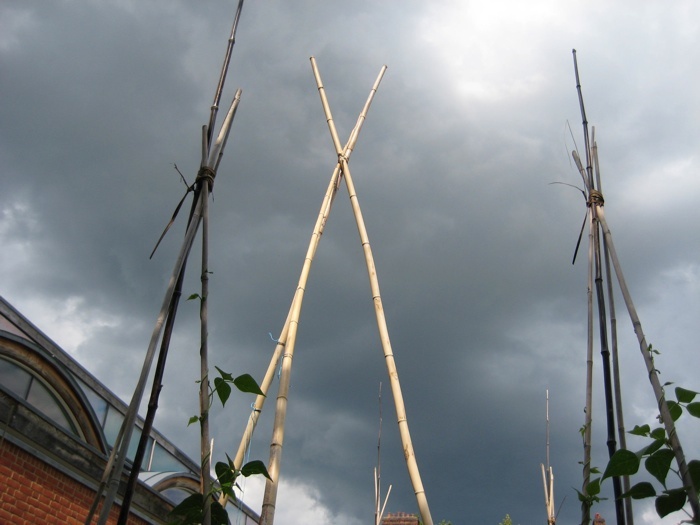 This entry was posted in Allotments, Harvest, Planting and tagged Allotments, Bamboo, Captain Swing, Harvest, Wood Imps on July 6, 2011 by katecorder.